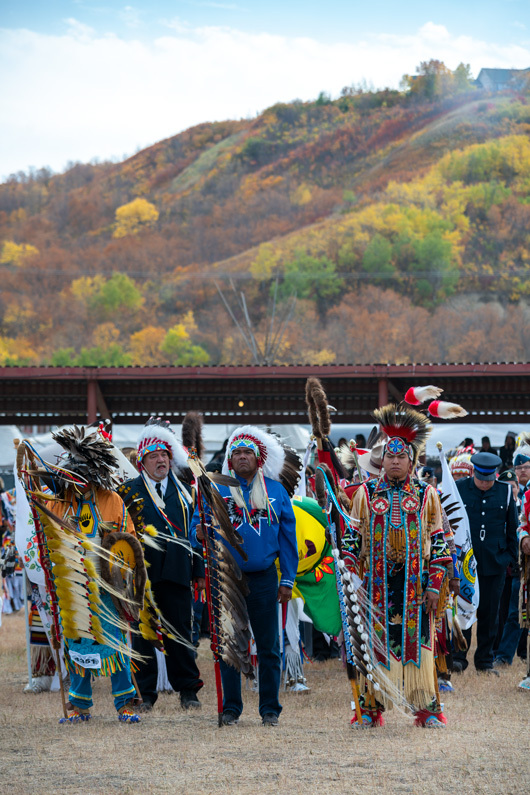 For the past 30 years, an annual gathering has taken place in the Qu’Appelle Valley to reconnect, recognize and honor the spirit and intent of Treaty 4. 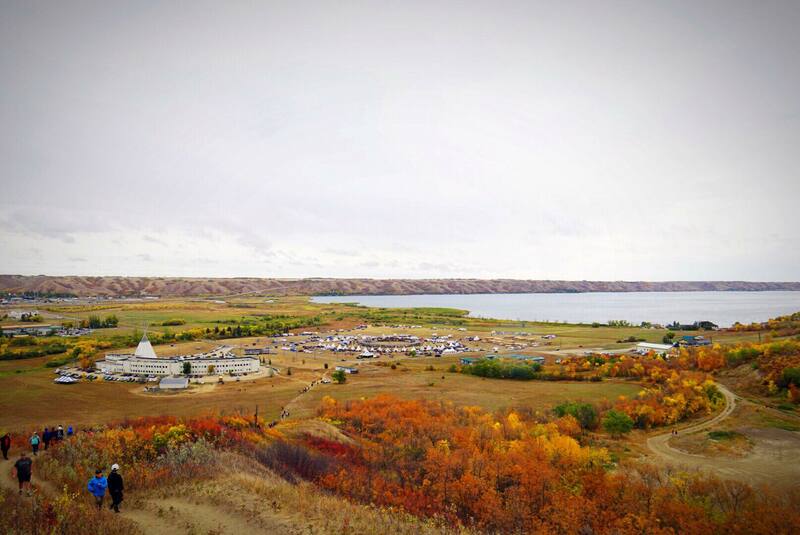 This week-long gathering takes place on the original site that Treaty 4 was entered into, during the week of the anniversary that Treaty 4 was made; promoting true acknowledgment and appreciation of the First Nations history in the Qu’Appelle Valley traditional lands and territories. The late Gordon Oakes had a dream, and in that dream came this symbol. The flag has four sections that represent, not only the Treaty aspect, but also represents many aspects to community, life, and our roles. This has been adopted as an icon in Treaty 4 Territory for both Indigenous and non-Indigenous peoples. The symbol itself holds many meanings, the Treaty aspects represents the breadth of the promise, which can be seen in each section – For As Long As The Sun Shines, Grass Grows, Waters Flow, and Buffalo Are On The Prairies. The buffalo represents the Education aspect of the Treaty promises, meaning Indigenous peoples are to receive and benefit from a western education, but also are to continue with the cultural & spiritual education of our ancestors. The deeper meaning to the symbol represents the community and the individual. Indigenous peoples hold the sun, earth, water, and buffalo in high regard, and are paramount in every ceremonial aspect of culture & spirituality. It represents the guiding factors of the individual while walking the red road and leading a good life, and to keep our culture and spiritual practices alive while living in a western world. It also represents the coming together of the community to share in and promote our cultural ways and values. A strong community is one that works together for this common goal. The symbol is a reminder of this for all people in the Treaty area. A Treaty is a formal agreement between two or more states in reference to peace, alliance, commerce, or other international relations. The numbered Treaties, six of which cover all of Saskatchewan, are sacred internationally recognized covenants that created a relationship between the British Crown and First Nations. On September 15th, 1874, the Cree, Assiniboine and Saulteaux Peoples entered into a sacred covenant called Treaty 4 with representatives of British Crown- Queen Victoria. This process took six days to complete. Treaty 4 was entered into on a government to government basis that recognizes First Nations sovereignty and governance. Several First Nations bands entered into Treaty Four at a later dates. The Treaty Four territory encompasses a vast portion of southern Saskatchewan with some 195,000 square kilometers in both Saskatchewan and a western segment of Manitoba with 36 First Nations representing over 60,000 members in their jurisdiction. Treaty 4 includes major cities such as Regina, Moose Jaw, Swift Current, Weyburn and Yorkton to name a few. Today there are misconceptions that only First Nations peoples are part of the Treaties, but that’s not the case. As the phrase “we are all Treaty people,” implies, both Indigenous and non-Indigenous people in Saskatchewan are part of the Treaty. Treaty rights existed before 1982 (the year the Constitution Act was passed), and those that came afterward, are recognized and affirmed within Canada's Constitution. All Canadians are beneficiaries of the treaties, whether on the Crown-settler side, the First Nations side, or both. Canada will be stronger when we have stronger Treaty relationships that honor and uplift the critical role of First Nations. However healthy relationships can’t flourish without education, awareness and mutual respect. The Annual Treaty 4 Gathering provides the avenue to build respectful relationships within the Treaty 4 territory and creates the opportunity for non-First Nations to learn about Treaty 4 and Treaty rights; as well as First Nations history and culture. With an average of over twenty-thousand participants, the Treaty 4 Gathering presents a unique opportunity for non-profit organizations, unions, and businesses to engage First Nations peoples with the services they provide as well as to learn more about working with First Nations people. The Annual Treaty 4 Gathering is a way to honor our ancestors; educate and empower our youth; continue to preserve our culture, values, and language; and ensure the spirit and intent of Treaty 4 continues.